NOTICE: Activation key must be used on a valid Steam account, requires internet connection. ABOUT THE GAME	Take part in an amazing journey, guiding the splendiferous adventurer Ernest Hamilton and his brilliant bird Sasha as they co-operate to crack crafty conundrums and challenges!Progress through 60+ levels set in four unique and visually stunning environments. Enjoy co-op or single player gam… eplay featuring both action puzzling and traditional problem solving. Immerse yourself into the fantastical storyline filled with extravagant escapades and memorable characters. 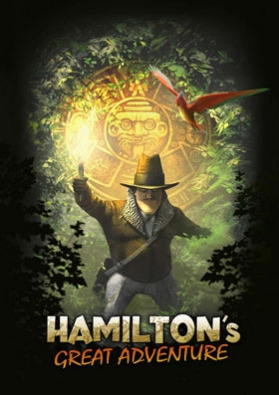 Join in on the fun as Hamilton’s Great Adventure delivers an exhilarating experience of exceptional family entertainment! Highly addictive puzzle adventure! Embark on a fantastic journey & unravel an ancient mystery! Puzzle solo or take a friend along on the adventure with simultaneous hotseat coop!SYSTEM REQUIREMENTS Operating System: Vista / Windows 7 (Windows XP and DirectX 9 are not supported)Processor: Dual Core 2.4GHz processorMemory: 2 GBHard disk space: 1 GBVideo: Shader 4.0 compatible card (minimum: Nvidia GeForce 8xxx, AMD Radeon 2xxx)DirectX®: Direct3D 11 ©Fatshark AB. 2011 ALL RIGHTS RESERVED.